Ground-based radar telescopes finally have penetrated the hazy atmosphere of Saturn's largest moon to yield the first reliable evidence that it might have hydrocarbon oceans. Researchers report their data from Titan matches the expected signal of mixed liquid hydrocarbons, including methane and ethane, online in the Oct. 2 SciencExpress. Carl Sagan and Stan Dermott had proposed a pure methane ocean on Titan in 1982, but Voyager's first pass by the moon observed temperatures and other conditions that did not fit their model. The following year, researchers determined a mixed hydrocarbon ocean would better fit the Voyager data. But the capability to measure Titan's surface with more certainty has come only within the past decade. Titan's clouds may be hiding a methane-ethane ocean beneath, with the most solid confirmation yet from recent ground-based radar observations. Image courtesy of NASA Jet Propulsion Lab. From the Arecibo Observatory in Puerto Rico, the researchers shot a radar beam at 13-centimeter wavelengths to Titan and waited to receive the reflection (which took about two hours). With ground-based radar observations, "Titan is about as far away as we can look," says Don Campbell of Cornell University, in Ithaca, N.Y., lead author of the research. The team made a second set of observations during the same time period in the following year, at the Green Bank Observatory in West Virginia, to back up the data. The team acquired several measurements that painted a fuzzy picture of the sunlit half of Titan's surface, with a relatively clearer core of reflection from the center, called the specular component. Just as the sun's rays glint off the faces of water waves, some of the radar reflects back directly to the viewer from that specular center point. The reflection patterns at the 13-centimeter radar wavelength show a smooth surface at that scale. The data also seem to match what are known to be the reflection patterns of a mix of liquid hydrocarbons at that wavelength. 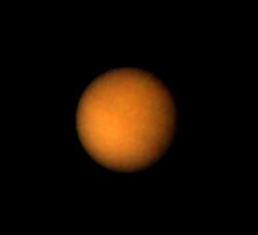 Titan's surface is about -179 degrees Celsius (-291 F). At those temperatures, Campbell says, a mix of ethane, methane and nitrogen could mingle in liquid form. Ethane is probably one of the major products of photochemical reactions in Titan's upper atmosphere, and it could rain out onto the surface. Campbell also says that such hydrocarbon oceans would serve to replenish Titan's methane-rich atmosphere, which is proportionally 10 times larger than Earth's. Otherwise, the methane would be stripped away in about 10 million years through interactions with ultraviolet light. Campbell and his co-workers note that the reflection patterns also could match a mix of smooth ice  either water, ammonia-rich water or some other organic-rich ice. However, they say it is highly unlikely because of known measurements in those wavelengths. They also note that the data show up to 75 percent of Titan's surface could be covered with hydrocarbon lakes or oceans, which is also unlikely, Campbell says. Instead, the surface might have varying surface roughness (with regard to reflectance) and therefore mixed substances. Jonathan Lunine, at the Lunar and Planetary Laboratory at the University of Arizona in Tucson, calls the paper "a very careful piece of work." Lunine and his coworkers were the first to suggest a mixed hydrocarbon ocean. As for substances other than liquid hydrocarbons, Lunine notes that water mixed with ammonia covering the surface would have to remain as smooth as an ice-skating rink, despite erosion, impacts or other surface processes. Liquid hydrocarbons, however, would always stay smooth. "If I had to choose between the two options," he says, "it's much easier for me to believe that 70 percent is covered in hydrocarbons than to believe so much of the surface was resurfaced with ammonia water flows, so recently that it's still smooth." "We have been wanting to test this hypothesis for two decades," says Caitlin Griffith, a Titan specialist also at the Lunar and Planetary Laboratory. "There have been repeated measurements of the kind Campbell et al. performed, but with not as good fidelity," she says. Now scientists must wait for further confirmation of the new ground-based observations from the upcoming Cassini mission. The NASA mission should reach Titan by July 2004. It will make close passes to the moon, and using near-infrared observations and a surface probe, it will pierce the satellite's atmosphere to see the surface below.